Use feng shui water fountains to bring in money and prosperity because water represents wealth. It is also used to correct imbalances arising from the lack or excess of other elements. Craft a simple water fountain that can potentially bring you health and wealth. It can serve both outdoor and indoor areas, and can be easily transported when made with lightweight materials. When looking for the pump, seek out on that is silent or has a quiet motor with suction that will adhere to the bottom of your pot like the submersible PonicsPump. Coated mesh can be found relatively cheaply at retailers like Amazon. For safety purposes, purchase a faux stone for holding the fountain's spout (in a size to fit your pot, whether large or small), rather than drilling into a real stone. 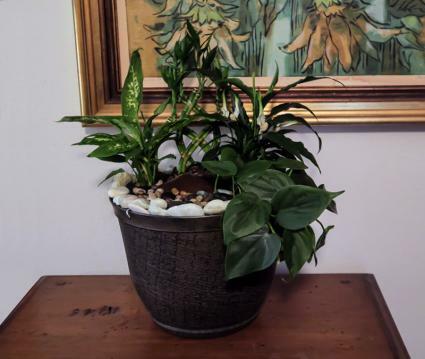 Plants should be moisture-loving species like lucky bamboo, English ivy, and dwarf rubber plants. Look for plants that need minimal nutrients beyond the water in the fountain itself. To download the instructions, click on the image or its caption to open the file in a new window or tab using Adobe Reader. Then you can either save the pattern for later use or print it out immediately. Click for the printable instructions. Feng shui is about creating an enviornment that is a balance of the five elements in a living space by removing excesses, and a water fountain can help with this task. For example, the element of water can enhance wood but weakens metal and destroys fire. Feng shui expert Laura Cerrano of Feng Shui Manhattan Long Island said, in regards to using the principles of feng shui to create a water fountain, "Adding a water fountain, according to the feng shui principles, is a powerful energy and mood boosting enhancer for both work or home environments. The water element offers a soothing healing energy through sound and is associated to the symbolic meaning of wisdom, flexibility and movement." Any water fountain can be adapted using feng shui principles. It is not the design of the fountain but the location of the fountain that matters when considering feng shui in conjunction with this water symbol. "A general location to place a water fountain (if room allows) is within the front entry point of your home, let that be the foyer for example," Cerrano said. "When placing the fountain, the direction in how the water flows is also important. For example, it is suggested to have the movement of water from the fountain flow into the direction of your home. The reason why? Because you hold the intention of attracting more wealth and/or career opportunities. If you choose to allow the movement of water from the fountain to face toward the front door, it is symbolic of pushing away possible opportunities that could have otherwise come into your life to help enhance career and wealth energies. Taking into consideration the sound and design of the fountain is also important. Ideally you want to hear the trickling of water, not the motor of the fountain." North - According to the principles of feng shui, north is ruled by the water element. Needless to say, north is a favored position for water features in the home. Place the fountain in the north to improve your career prospects and ensure success in life. Southeast - Placing it in the southeast corner of the living room brings you wealth and prosperity. Care should be taken to direct the flow of water towards the center of the room and away from the door. You don't want money to flow away from your home. Since southeast is ruled by the element wood, arranging several healthy plants around the fountain helps your wealth to increase. East - This direction is important for health and is ruled by wood. The water element is sometimes placed here to correct negativities that cause ill health and discord in the family. 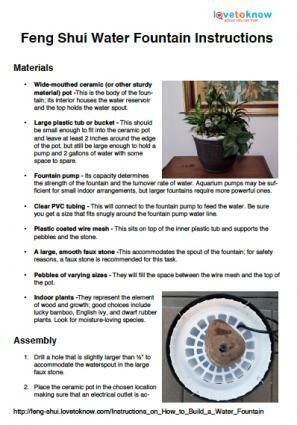 If you're installing the fountain on your own, follow the general guidelines of placement first. Having a portable fountain gives you the option of changing the placement if necessary. A knowledgeable feng shui practitioner may be able to guide you in determining ideal locations in your particular home if you are having difficulty determining the proper spot. Wrong placement of the water feature can have undesirable outcomes. South - Since south is ruled by fire, keeping a water element here is a big no-no. It may result in loss of face and bad reputation since south stands for fame. Bedroom - The sound of flowing water may be soothing to the ears, but it also creates high energy levels unsuitable for an area designated for restful sleep. Placing a water feature in the bedroom, a feng shui mistake, may bring in coldness into the relationship as water douses fire (or kills passion). Marital discord, respiratory problems, and financial ruin may result. If you want to place the fountain in the southeast corner of the house which happens to fall in the bedroom, you can choose the southeast corner of the living room instead. Below a bedroom - Feng shui fountains or other water features should not be kept in any rooms in the lower floor of the house that comes below the bedrooms in the upper floor. Below stairways - It is tempting to utilize the space under the stairways, especially when space is premium, but feng shui advises against keeping a water feature there. It may adversely affect the overall well-being of the family and the health of children. Keeping the fountain clean and the water crystal clear is important. The water level in the reservoir and the water flow from the spout should be checked frequently. Avoid using hard water that can cause salt buildup and blocks in the system. The water level will reduce due to evaporation. Refill the reservoir before the level dips below the pump. Dry runs will spoil the pump and create negative energy. After running the fountain for a few days you will be able to determine how often it requires refills, but there may be seasonal variations. Once you have placed your fountain in a desirable location, it is time to sit back, relax and enjoy the soothing sounds of water. Water has a therapeutic impact and you will immediately find that your stress levels drop and you become more relaxed.